Of all building elements, windows, doors, their fittings and embellishments can usually tell more of the history of a building than any other. 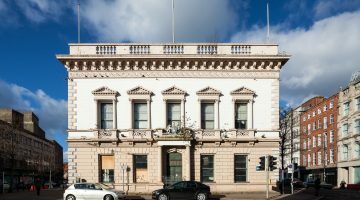 Unfortunately many Georgian terraces, Victorian houses and Edwardian villas have had their picture rails, deeply moulded skirtings and architraves removed, but fashions change and many people now want to restore some of the character of their buildings. Wood is still the most versatile construction material known and for interior fittings is unsurpassed. Good joiners can make anything from a drawing, a scrap of the original or even a photograph. There are ranges of standard mouldings, in many cases these will be appropriate, but local and regional variation is important and particular mouldings may be specially cut. It is usually not much more expensive to do this particularly when long runs are involved. The scale and proportion of the room should determine the complexity of the mouldings otherwise the joinery becomes grander than the building. For replication purposes, examples may be found from other houses of the same period which have not been altered or from museums or photographs. Sometimes details on the outside of the building were replicated inside. Often mouldings were covered up rather than torn out and may be found tucked away under the stairs or in the attic. Windows deserve a special mention as they are probably the most important factor in the appearance of a building. Timber sliding sash windows, the glazing often divided into small rectangular panes, are the most common traditional window type in Ireland. They look marvellous and give efficient ventilation control and ease of escape in the case of a fire. However, they have a reputation for being draughty and hard to maintain. These problems are exaggerated by salesmen of PVC-U replacements who claim their reproductions look the same and as a result, a rash of replacement windows is sweeping the country. Sometimes thin strips are inserted between two panes of a double glazed unit in an attempt to replicate the pattern of glazing bars, but they fail miserably, fool nobody, are awkward and clumsy, an insult to an old house and stomach turning pastiche in a new one. In addition, there is growing concern over the environmental implications of the use of PVC-U and the toxic waste it can give off in fires. It is always preferable, and often cheaper, to repair rather than to replace original windows; exact replacements of fine glazing bars and mouldings can be made. Details like the width of frame showing around the window on the outside are of historical importance and should be faithfully matched. Traditional sash windows can be fully draught proofed, easily and inexpensively, with a comprehensive system of brushes and seals. Fitting ‘Simplex’ sash hinges allow the windows to be cleaned from the inside. In the event of decay, hardwood sections, painted to match the original, can be inserted as in many cases it is only small areas of the sash, usually the cill member, that have decayed. Weights, sash cords and pulley wheels can be overhauled and replacements are also available. Some very small windows never had weights, instead a piece of wood jammed the sash open. Modern spiral balances are an appropriate replacement in some circumstances but in listed buildings the original system should be replicated. 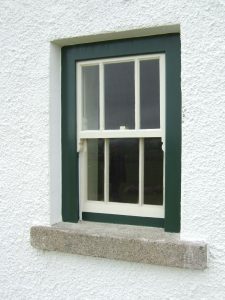 Leaded windows have also been in use since very early times. In the late eighteenth century some of the simpler forms of leaded windows were copied in cast iron but these forms are rare in comparison to the vertically sliding sash windows. It is difficult to insert double glazing on small paned sash windows without increasing the size of the glazing bars but there are now slim systems available. It is worth remembering that double glazing is the least economic way of insulating a building; it is better to draught seal the windows. Shutters or heavy curtains may be used, radiators placed under windows and an extra layer of insulation added to the roof. 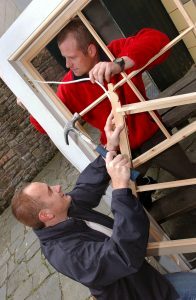 Secondary glazing can also be effective and does not destroy the character of a building. There is an endless variety of traditional door types, both sheeted, and framed and sheeted, or panelled, generally with four or six panels. Some modern ‘off the peg’ doors are good but others are inappropriate reproductions and have no place in old buildings. Traditional door sizes rarely match ‘off the peg’ doors and the opening itself should not be changed – the original widths and heights are more important than modern standardisation. Many panelled doors were unnecessarily ripped out, or sheeted over, to improve fire resistance. It is perfectly feasible to upgrade an existing door without losing its character; however the Fire Authority often require test certificates, mainly in public buildings, so new fire resisting panelled doors may have to be made in some instances. Architraves and jamb wall panelling that frame the door should be retained or replicated. Doors were invariably painted, though they were sometimes grained and the modern preoccupation with natural pine, though attractive, is historically incorrect. External doors, except in the rare cases where they were made from oak, walnut, teak or other exotic woods, must be painted. External joinery, especially fascias and barge boards, require maintenance and should be made to a high specification if replication becomes necessary. Treated softwood, exterior plywood, hardwood and exterior timber particle boards are all useful and should be painted. Decorative timber barge boards, generally Victorian, are very important features to a building and should be retained. Finally, the conservation of historic buildings should not be at the expense of the world’s forests; all timber used should be specified as coming from a sustainable source through one of the certification systems – eg. FSC.